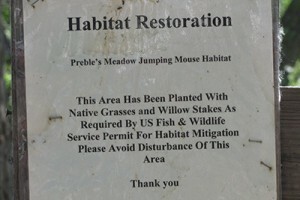 A sign in an area near Kingfisher Bridge that would be inundated by the Chatfield Reallocation Project. Chatfield State Park is unique. The 587 acres that would be inundated by the Reallocation Project includes 43 acres of mature cottonwood trees which offer habitat for songbirds that is “rather unique within the Denver Metro area and possibly along the South Platte River. Loss of this habitat for songbirds would cause long-term adverse impacts that are not easily mitigated.” (DEIS, page 4-83) Furthermore, because wildlife tends to thrive in transition zones between habitat types, both the variety of habitats and quantity of each within the park are important. Enhancing land for one species will almost certainly diminish its value for something else. Converting grasslands to wetlands may enhance their value for many birds, but it won’t make grassland birds prefer to live in wetlands. 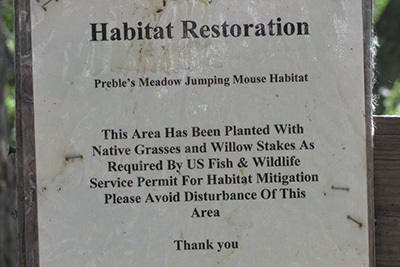 Although conservation easements may provide longterm protections for important habitat, they do not increase habitat. Conserving something that already exists is not the same thing as replacing something that has been destroyed. Today Park visitors can enjoy encountering, observing and photographing wildlife on 587 acres that will be alternately flooded and mudflats with Reallocation. This habitat is among the most wildlife-dense in the Park. The only way to compensate Park visitors’ loss is to expand the Park by adding comparable, contiguous habitat. Mitigation on private land may help some affected wildlife, but it will not help Park visitors.